The Brontë Stones are a group of stones placed in the landscape between the birthplace of the Brontë family in Thornton and the parsonage where they wrote their famous work in Haworth. The project was devised by writer, Michael Stewart, who took inspiration from another literary walk. There are three stones that celebrate the bicentenaries of the three sisters: Charlotte, Emily and Anne, and a fourth stone to mark the significance of the Brontës as a literary family. 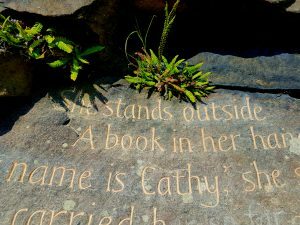 The stones have been carved by fine art letter carver, Pip Hall, with specially commissioned literature by famous contemporary female writers. The project was curated and delivered jointly by Michael Stewart and the Bradford Literature Festival and funded by the Arts Council England. The Brontë Stone is situated in Thornton Cemetery and features a poem by award-winning writer Jeanette Winterson. It overlooks Pinch Beck Valley and the viaduct, and offers stunning views, under the shade of sycamore trees. 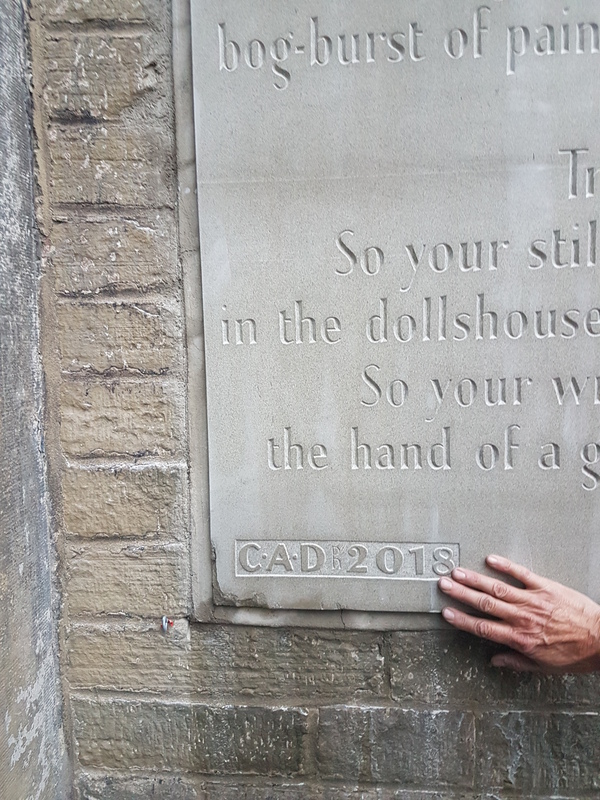 The poem is carved into a beautiful slab of local sandstone, sourced from Bingley Stone quarry in Cullingworth. As you would hope and expect, the Emily Stone is sited in the midst of windswept moorland overlooking Haworth. 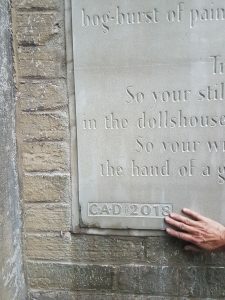 The poem is written by internationally acclaimed singer and musician, Kate Bush, and is carved into the side of Ogden Kirk, a stunning outcrop of rock above the clough. The poem was written as a tribute to Emily Brontë in her bicentenary year, but also to mark forty years since the release of Kate’s debut single, ‘Wuthering Heights’, which was number one in the charts for four weeks in 1978. The stone is situated by kind permission of Yorkshire Water. The Anne Stone lies in the top right hand corner of Parson’s Field, a wild flower meadow behind the Brontë Parsonage Museum. 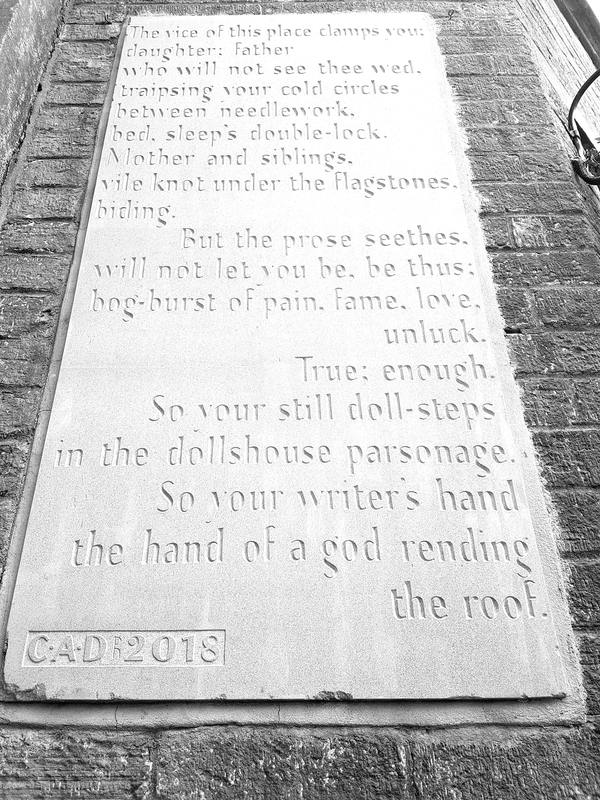 It is carved with a poem by Scottish Makar, Jackie Kay. Anne Brontë is the only sibling not buried in the family vaults under the church next to the parsonage. Instead, she is buried in St Mary’s churchyard in Scarborough. The poem acknowledges a return of sorts, to the place where she grew up and wrote her two important novels. Many thanks to the Brontë Parsonage Museum for kindly giving permission. This is a beautiful 9-mile route over the hills from Thornton to Haworth that takes in all four of the Brontë Stones. 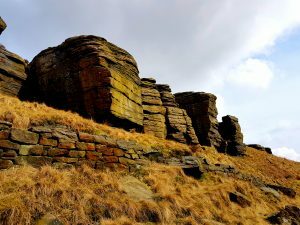 A linear route over the moors that also includes Ogden Kirk, Denholme Beck, Nan Scar and Oxenhope, following the Brontë Way in places but elsewhere offering interesting alternatives to this well-trodden trail. A charming and simple 4-mile walk around Thornton, the birthplace of the Brontë children and home to the Charlotte Stone. The walk takes a short loop across the hills around Thornton, starting at St James’ Church, opposite the Old Bell Chapel where Patrick Brontë worked. It also takes in Thornton Hall, Hanging Fall, Thornton Viaduct and the Brontë Birthplace, and has some great views over the valley. A varied 7-mile walk around the lush valleys north of Haworth, taking in Newsholme Dean, the Worth Valley and Holden Park. It follows the Railway Children Walk to begin with, before climbing through Oakworth and Holden Park to charming Newsholme hamlet and Pickles Hill, then dropping down to follow the river Worth back towards Haworth and Parson’s Field where the Anne Stone is placed. A strenuous and remote 15-mile walk across the moors high above Oxenhope and Haworth, traversing the landscape that inspired Wuthering Heights. This is a hearty yomp across the wild moorland Emily loved to roam. The route takes in Top Withins, Alcomden Stones and Ponden Hall, as well as various other beautiful sites. For serious walkers only! The maps have been made possible thanks to the help and support of the University of Huddersfield, Bradford Council and the Brontë Parsonage Museum. In particular, we would like to thank Diane Fare, audience development officer, for her time and expertise. Nice piece in the Times Literary Supplement. Here’s the piece in the Yorkshire Post about the Brontë Stones written by Yvette Huddleston.